The Premier Property Group (PPG) is proud to announce the next wave of luxury condominium development in Destin’s quaint Crystal Beach community—Parkside at Henderson Beach Resort. Part of the Henderson Beach Resort portfolio of accommodations, this distinctive retreat is now open for sales and will provide an elegant addition to the resort’s upscale, secluded backdrop. Parkside is being sold exclusively through PPG, and early trends suggest that demand will quickly outpace supply. Notably, of the two buildings initially released, 20 of the 24 available units were pre-sold in a pre-launch VIP release. Parkside at Henderson encompasses one-, two- and three-bedroom residences with thoughtfully designed layouts for easy, everyday living. PPG’s commitment to quality construction means residences come with high-end stainless steel appliances, polished chrome plumbing fixtures, quartz countertops, all-wood cabinetry, frameless glass shower enclosures and a craftsman-style interior package. The kitchen, living and bathroom areas offer hard floor surfaces, and bedrooms are fitted with carpet. Owners and guests will also appreciate extras that include a wet bar and undercounter wine fridge as well as a generous balcony for entertaining or simply enjoying a quiet evening overlooking the sparkling waters of the Gulf of Mexico or lush resort landscape. Upon completion, Parkside owners will enjoy full access to the Henderson Beach Resort lifestyle characterized by an expansive amenities package that includes a full-service spa, fully-equipped fitness center with classes, multiple resort pools including a lazy river, poolside cabanas, free shuttle service and a private beach. Families can take advantage of an onsite kid’s club that features a day camp and kid’s night out activities as well as live entertainment provided on the resort property. Bicycle, kayak, snorkel and paddleboard rentals are also available. 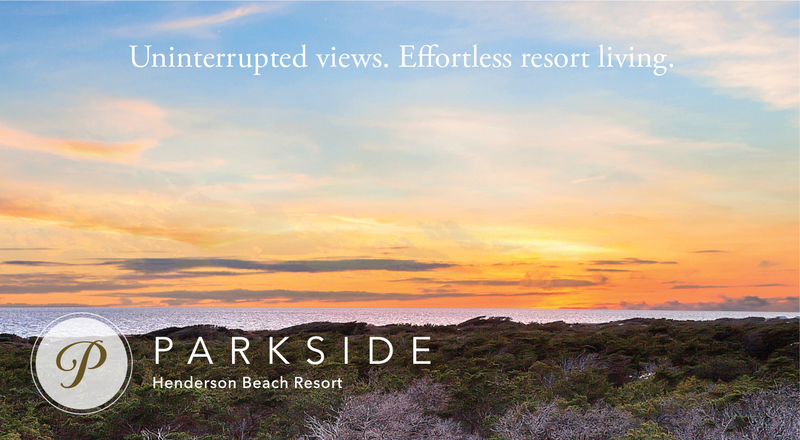 Parkside at Henderson promises to raise the bar on condominium living through concierge and valet services, in-room and poolside dining, daily cleaning, courtesy shuttles and beach chair and umbrella service. Owners and guests can take advantage of multiple on-site restaurant options including Primrose and the area’s celebrated Beachwalk Café, Destin’s only fine dining located directly on the Gulf of Mexico. To engage in a more social atmosphere, Horizons octagon-shaped beachfront bar has quickly become a Destin hot spot for visitors and locals alike. Parkside residences are offered from the low $500’s. Construction is expected to commence this summer with the first residences coming online in early 2020. For more information, contact Bryan Whitehead at 850-204-3819 or bryan@theppg.net.